The first time you run cam2pc, a Configuration Wizard appears. 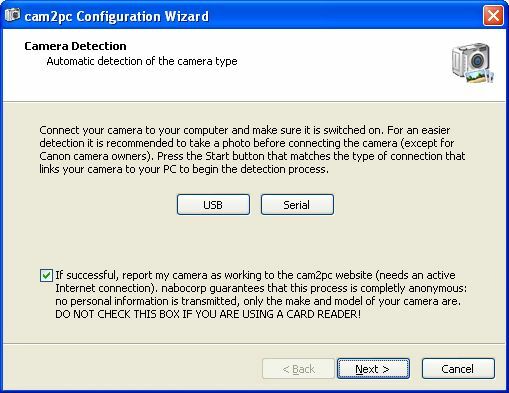 This Wizard will help you in setting up your camera in cam2pc: its type and the way you want to download pictures from it. If you choose to skip this wizard by clicking the Cancel button, you can rerun it at any time by displaying the cam2pc options and choose the Wizard button. The wizard is self-explanatory: the purpose of each step is detailed and all the options available are described. You should take the time to carefully read those descriptions. If you successfully run the Wizard then you can safely skip the sections explaining how to setup file transfer in this documentation.